Today I'm sharing a couple of my latest outfits for 'What I Wore Wednesday' and linking up over at the Pleated Poppy! 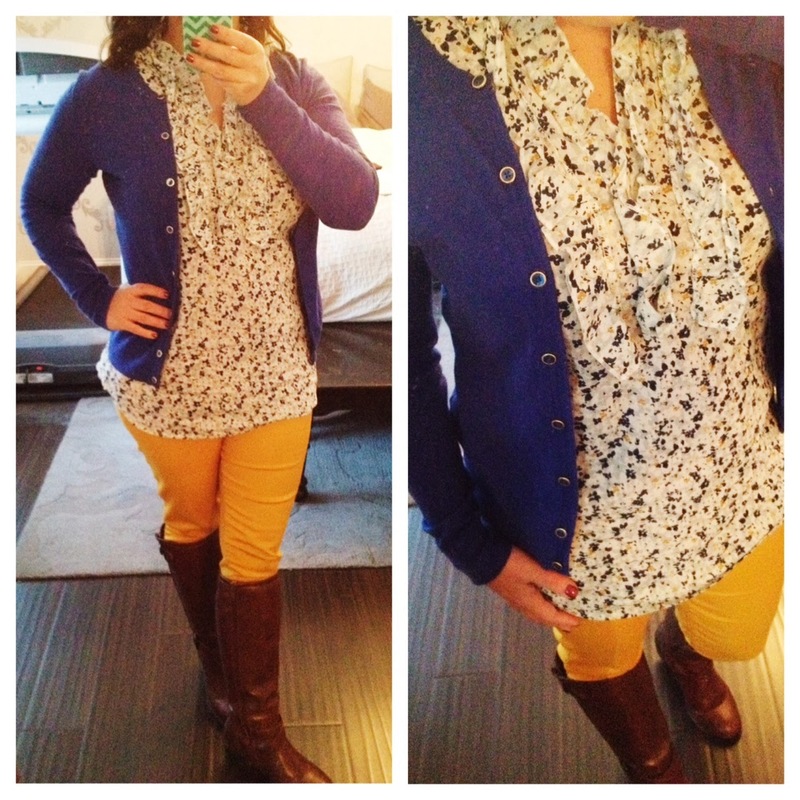 Lately I've been really into mixing pattern and adding pops of color to my work outfits! This first outfit is one of my favorites because it's cute, affordable, and REALLY comfortable! The mustard colored stretch skinny jeans were only $13 (now on sale for $9) from Walmart! I actually purchased them a couple months ago in three other colors because they fit my curvy body so well and are super affordable! The ruffled flower print top is from Target from a few years back. The royal colored cardi is from Banana Republic outlet last summer. The boots have become my 'go to' footwear of choice as I can run around all day at school and my feet don't hurt...they're from Kohls purchased in the fall. The dress code for staff/teachers at my school isn't super strict...we can wear jeans, for instance, any day of the week as long as we still look professional and put together. Here you can see I've paired dark denim jeans from American Eagle with a classic black blazer from Walmart (another totally awesome find from Wally World). I added a striped black and white tee (can't remember where it's from) and a hot pink bauble necklace from Kohls for a pop of print and color! I'll be busting out some more hot pink this Friday for Valentine's Day! Unless of course we don't have school (again) due to an impending snow storm (again)! Alas, such is the life of a Mainer! Very cute! I love both of these outfits! 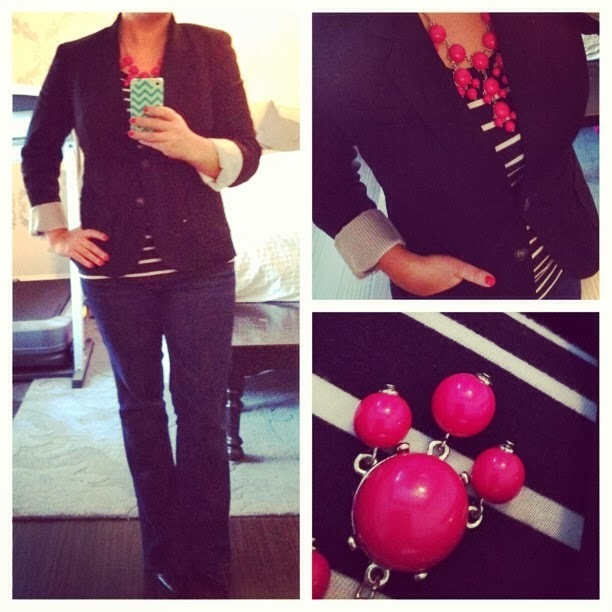 The second look with the blazer, pop of red from the necklace and the sleek jeans is a great combo!